Throughout his time as the President of Cuba, many attempts were made by the United States to assassinate Fidel Castro. The attempts were made by the United States’s Central Intelligence Agency. All the attempts on Fidel Castro’s life failed. Following World War II, the United States became secretly engaged in a practice of international political assassinations and attempts on foreign leaders. For a considerable period of time, the U.S. Government officials vehemently denied any knowledge of this program since it would be against the United Nations Charter. On March 5, 1972, Richard Helms, Central Intelligence Agency (CIA) Director, declared that, “no such activity or operations be undertaken, assisted, or suggested by any of our personnel.” In 1975, the U.S. Senate convened the Senate Select Committee to Study Governmental Operations with Respect to Intelligence Activities. It was chaired by the Senator Frank Church (D-Idaho). The Church Committee uncovered that CIA and other governmental agencies employed a so-called tactic of “plausible deniability” during decision-making related to assassinations. CIA subordinates were deliberately shielding the higher-ranking officials from any responsibility by withholding full amount of information about planned assassinations. Government employees were obtaining tacit approval of their acts by using euphemisms and sly wording in communications. The Church Committee stated that it substantiated eight attempts by the CIA to assassinate Fidel Castro in 1960-1965. Fabian Escalante, a retired chief of Cuba’s counterintelligence, who has been tasked with protecting Fidel Castro, estimated the number of assassination schemes or actual attempts by the Central Intelligence Agency to be 638. Some of them were a part of the covert CIA program dubbed Operation Mongoose aimed at toppling the Cuban government. The assassination attempts reportedly included cigars poisoned with botulinum toxin, a tubercle bacilli infected scuba-diving suit along with a booby-trapped conch placed on the sea bottom, an exploding cigar, a ballpoint pen containing a hypodermic syringe preloaded with the lethal concoction Blackleaf 40, and plain, mafia-style execution endeavors, among others. There were plans to blow up Castro during his visit to Ernest Hemingway’s museum in Cuba. Some of the plots were depicted in a documentary film entitled 638 Ways to Kill Castro (2006) aired on Channel 4 of the British public-service television. One of these attempts was by his ex-lover Marita Lorenz whom he met in 1959. She allegedly agreed to aid the CIA and attempted to smuggle a jar of cold cream containing poison pills into his room. When Castro learned about her intentions, he reportedly gave her a gun and told her to kill him but her nerve failed. 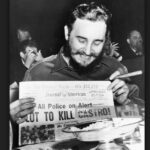 Some plots aimed not at murder but at character assassination; they, for example, involved using thallium salts to destroy Fidel Castro’s famous beard, or lacing Castro’s radio studio with LSD to cause him disorientation during the broadcast and damage his public image. Summary of Facts Investigation of CIA Involvement in Plans to Assassinate Foreign Leaders, 5 June 1975 [91 Pages, 3.9MB] – The following is a summary of facts gathered by the Executive Director of the CIA Commission concerning possible CIA involvement in plans to assassinate foreign leaders.